The Silk Road trial verdict is in: Ross Ulbricht is the drug-trafficking criminal mastermind Dread Pirate Roberts, at least in the eyes of the Federal Court of Manhattan. 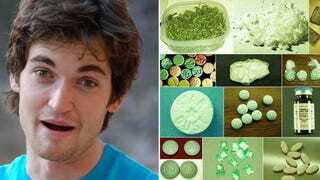 Ulbricht has been found guilty of running the infamous darknet drug bazaar. A jury found the 30-year-old Californian guilty on all counts, including money laundering, drug trafficking and computer hacking. He faces a maximum penalty of life in prison. And so ends at least this chapter of the indescribably weird Silk Road saga, blame firmly pinned: After a topsy-turvy trial that included evidence of Hells Angels hitman and arguments over the evidentiary relevance of emoticons, the verdict came in quick. The trial went terribly for Ulbricht, who did not testify. While his defense lawyer Robert Dratel conceded early on that Ulbricht had started the online drug empire, he argued that there was no way to prove his client had continued to run it. The case hinged on whether or not the prosecution could convince the jury that Ulbricht was, beyond reasonable doubt, the "Dread Pirate Roberts" who created and oversaw the Silk Road from its inception until its ignominious FBI seizure. The defense leaned on the idea that digital identity is inherently murky as a way to sow doubt. Dratel cast a finger at Mark Karpeles, the erstwhile CEO of fallen Bitcoin exchange Mt. Gox, claiming that Karpeles had set Ulbricht up to take the fall. It wasn't enough to stop the jury from finding Ulbricht guilty of "Continuing Criminal Enterprise," which is commonly known as the "Kingpin" charge. Prosecutors countered the patsy narrative with evidence showing connections between Ulbricht and the Dread Pirate's Silk Road business, including $13.4 million in Bitcoin transfers from the Silk Road to his personal computer. The volume of evidence against Ulbricht, including personal journals, was damning. It may have helped if the defense had been allowed to interrogate exactly how the prosecution and law enforcement officials obtained and verified the digital breadcrumbs that led them to Ulbricht, but as it was presented to the jury, the connection between Ulbricht and the Dread Pirate Roberts looked convincing. The defense's insistence that the true Dread Pirate Roberts had planted the ample evidence to frame Ulbricht lacked the necessary heft for a doubt-sowing counter-narrative. It looked especially flimsy because testimony asserting that federal agents initially suspected another man was barred and the defense's expert witnesses were rejected for procedural reasons.